The farm has loads of well-rotted manure available for use on your gardens, plots or allotments. Manure is a valuable resource which completes the nutrient cycle and allows much of the nitrogen fixed with Legumes, vegetables or forages to be returned to the soil where it can become available for subsequent crops. Manuring aims to improve the structure, composition, and water and nutrient retaining properties of the soil. It is also important as a source of energy and nutrients for the soil ecosystem. Well-rotted manure can help you produce healthy, tasty crops for you and your family. Handle with gloves and spread approx. 1 kg per M2, and dig in to a depth of 15 -25 cm, rake over top of plot and leave for 2 weeks before hoeing off any weed seedlings that have emerged. Plant plot as soon as soil has warmed up, usually mid-March for hardy crops, later for tender plants. Refer to seed packets for more info. 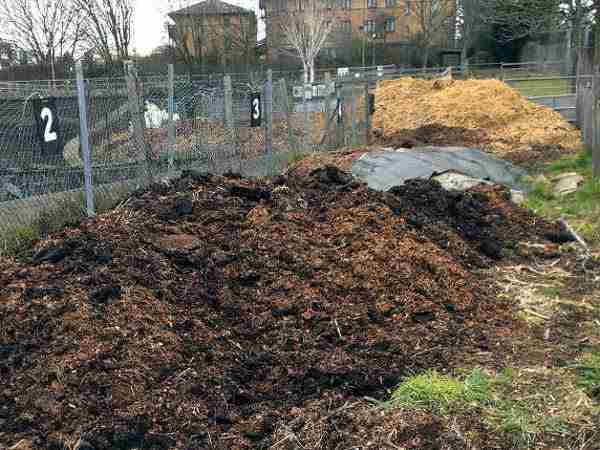 Manure can also be used as a sheet mulch around fruit or flowering shrubs, as a starter in your compost heap, in potato or celery trenches or in raised beds. Large applications of manure can cause some crops such as carrot to fork, and will need to be limed. It is not a substitute for potting compost. Manure gatherers need to wear suitable protective clothing such as wellies and gloves, and need to speak to a member of staff before starting to dig. They will show you where to take the muck from. You also need to bring your own bags or other suitable containers, are advised to wash your hands at the facilities in the farm, and to remove outside footwear before entering home. You may borrow a wheelbarrow and pitch fork if available. Again, seek a member of staff for info. There is parking in local streets which is free after 11am Mon-Fri, and all weekend. There is no on site parking available. Bag your muck, barrow it down, pile by gate, get vehicle, load up. The rest is up to you. Do not park outside the farm. This is permit only and you may be ticketed or clamped. The manure is free for a limited period. Please ask a member of staff before taking from a heap. Thank you.